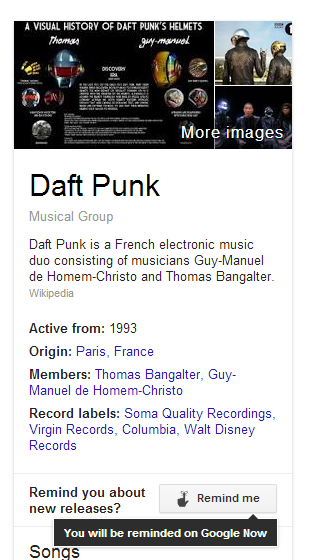 If you search Google for music artists, actors, books, TV shows and you're logged in, you'll see a new "Remind me" button in the Knowledge Graph card. 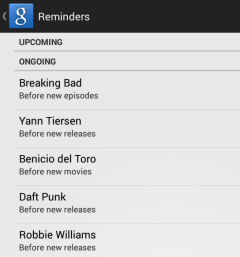 Click the button and "Google Now will remind you about new releases/movies/episodes on your phone or tablet". Until now, you could add time-based and location-based reminders to Google Now. These new reminders are special and can only be added from Google search. You can manage them from the Google Search app on your mobile device: just go to Settings, My Stuff and select Reminders. This feature was added last week, when the Google Search app for Android was updated.